I just realized that one of my favorite (older) pots seems to have been a direct influence on a new design style I started experimenting with last year, but haven’t (yet!) further pursued or developed. The “favorite pot” I’m referring to is actually a jar that was Raku fired which I’ll never sell because I fell in love with it before it had even completely cooled. A Raku firing inevitably means a loss of control in the process (which happens when you dance with fire and smoke and combustion) that generally – or at least sometimes (and hopefully!) – results in happy accidents. This pot was one of my happiest accidents. Not entirely accidental, of course: I did throw it, trim it, bisque fire it, and glaze it with white crackle and blue accents, envisioning something similar to the end result. It was loved in each step of the process, which isn’t always the case as I try new pieces. Yet, once the hot, smoky, intense thrill of the Raku firing grabbed hold of this pot, there was a magical quality that infused the pot itself, leaving incredibly beautiful marks and details – cracks, charring, and drips I could have only dreamed of, and I was left with a favorite. It still has a faint smoky scent and I never wanted to part with it – and of course can never duplicate it – so it holds cotton balls for me and sits on my bathroom counter, delighting me multiple times each day. So why has it taken me this long to notice the visual connection of this jar to my newer work? The new pieces I began to experiment with (below) are porcelain tumblers, (similar in shape to the original jar) – although this new glaze design may end up on other forms, as well: vases, jars, wide bowls. I’ll have to play around. As for the process: I’ve left the outside unglazed for that delightful tactile experience – and the inside is glazed clear with the faintest hint of blue, reminiscent of the blue on my beloved jar. But the obvious influence has come through in the organic graphic black surface design, reminiscent of the unexpected black charring that occurred on my sweet Raku jar. For these porcelain pieces, I was seeking a way to get the blackest black on the whitest white. Often black glazes over white will have blue or green undertones, so to keep it a rich black, I’ve used a black underglaze on a bare white surface, with no overglaze. The patterns themselves will likely evolve as I play around with what like, what works, and how to best create or transfer these designs to a curvilinear surface. This discovery of a subconscious influence raises the question: How are we inspired? I’ve always been a bit thrown off by that question: What inspires you? Because I just think inspiration is everywhere – surrounding us, and within each of us – but we just have to tap into it, and create a safe (mental, physical, spiritual) space to access it, or let it poke it’s head out. Sometimes it’s obvious: We see something we love and want to work it into our creative endeavors, or develop the ideas and images further. But sometimes inspiration isn’t as directly cause & effect. So where did it come from? For these new designs, I’ve realized over a year later, that perhaps this visual image was embedded deep in my subconscious somewhere – as a thing that has brought me delight – waiting to be re-expressed in a similar format, unbeknownst to me exactly where it stemmed from. I tend to want to answer in the cliché: I’m inspired by nature – by other artists – by new experiences, adventures, simple moments. Because this is true. But I think these are just the scenarios where I find the space to allow what’s within to feel safe enough to begin to come out in different forms. When we see something that immediately inspires us…why? Why do we love it? (When someone else doesn’t?) Why this instant connection? What do we love about it, and why does everyone respond to things so differently? I’m not here to provide answers 🙂 I just like asking the questions, and trying to stay curious! My darling jar, objectively, isn’t necessarily anything special. It’s not a terribly difficult or refined form, or any revolutionary work of craftsmanship. It’s perhaps a bit amateur. Yet somehow it touched my heart and didn’t let go. The pattern is sort of…Japanese Ink painting / meets abstract landscape painting / meets decaying subway wall pattern. Each of which I find beautiful in their own very different way. Who’s to say why we love one particular object so dearly, or how and why certain things take our breath away unexpectedly? I don’t know why I sometimes find beauty in a grimy old rusty, cracked subway wall. I just know there’s something magical about it when I do. I’m trying to remain open to inspiration wherever (and whenever) it may strike, and was fascinated to realize that my brain seems to store up ideas and saves them for later without my conscious participation. Can’t wait to see what other inspiration will come from here. Stay tuned as I play with these ideas! Now that Thanksgiving has passed, it really has started to feel like the holiday season. Which means…it’s time for another Holiday Fair! I’ll be selling my ceramics at IDEO’s Wunderfaire in 2 days – this Thursday from 4:30 to 8pm, which is perfect if you work downtown in San Francisco and want to just pop in for some holiday cheer! Stop by to check it out! I’ll be there next to Sita, who will be selling her paintings, among other things. There will be vendors, food, music, and general merriment. Can’t wait to see you there! Save the Date! 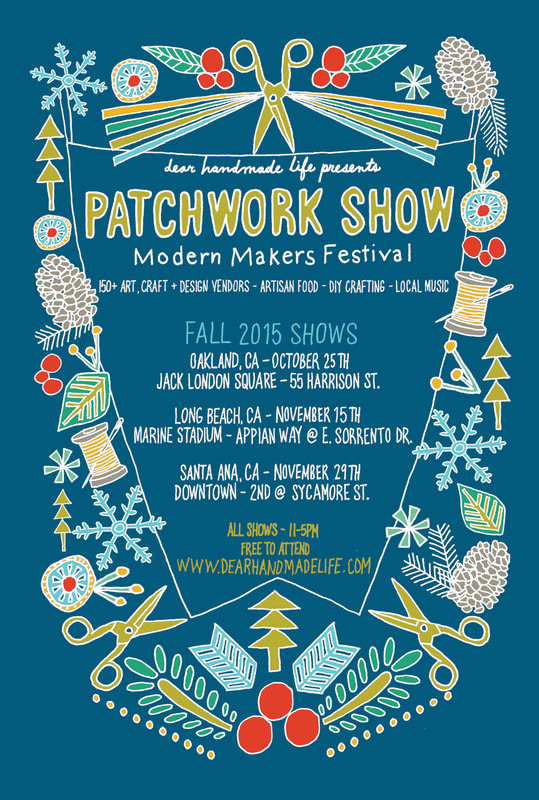 Patchwork Show! I’ll be selling my work at this fabulous craft fair in Oakland on October 25th. It’s in Jack London Square, it’s free to attend and I hope you all can make it! I’ve uploaded a few more pieces for sale! This red one would probably fall into the “Perfect Salad Bowl” category if you asked my cousin and her husband. Many more to come!